The Hillsboro FFA Chapter exhibited many different things at the Highland County Fair. One of the species exhibited was sheep. One of the chapter members that exhibited lambs raised her own lambs. So her project for the fair started more than a year ago. Once the lambs are born the member performed vaccinations and docked their tails. During the summer she worked them and got them ready for the fair. 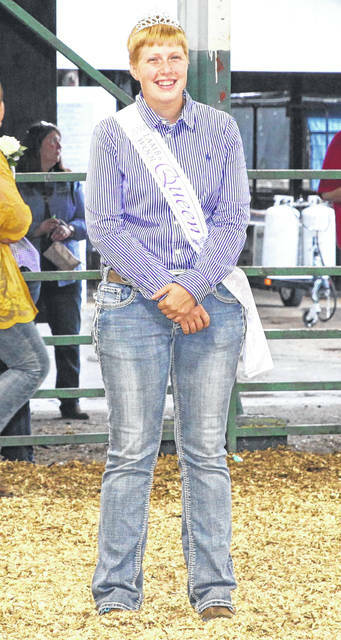 The Hillsboro FFA member that exhibited sheep was Lana Grover, who is also serving as the 2018 Highland County Lamb and Wool Queen. During the lamb show at the fair she helped pass out awards all the while having to exhibit her lamb. To become the Lamb and Wool Queen she had to fill out an application on how to make the sheep industry better. She also had to go through an interview process. During the interview she had to convey her knowledge of sheep breeds, by products and how she is directly related to the sheep industry. Submitted by Joe Helterbrand, Hillsboro FFA.